Well it's been a while since I last posted...let's just say that I got into the full swing of my Birthday celebrations and combined them with a fabulous Hen weekend full of giggles and I'm still recovering from it all LOL! Tip: When playing with double-sided patterned paper, use the reverse side as a guaranteed coordinating piece of DP for your project! Oh yeah - check me out; using up a slither of patterned paper from my stash *grin* This design is perfect for de-hoarding some of that paper that I've been stroking and not daring to administer the scissors to. I added a bit of 'oomph' to my panel of DP with a Copic Spica Pen (Clear) and some buttons - it looked kinda plain without 'em. So fancy de-hoarding some of your own DP? 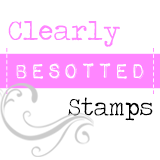 Fancy just playing along with us even if you wanna keep your inky mitts on your DP stash? Then you know what to do: join us! However, before you do, feast your eyes on the fireball of talent that is the rest of the CASE study DT! Have a super duper weekend and thanks so much for stopping by here! Jill is proving to be a fabulous muse for us this month: She's reunited me with some inky techniques that I'd long forgotten about so I'm definitely thankful for her nudging me in the direction of having plain inky fun when it comes to stamping! Sunshine was definitely the starting point on this card with my own soft spot for a graphic kinda style with my own scene. I had fun layering that stamp in black and two shades of purple (hard to tell on my pic but there's more depth to it IRL!) 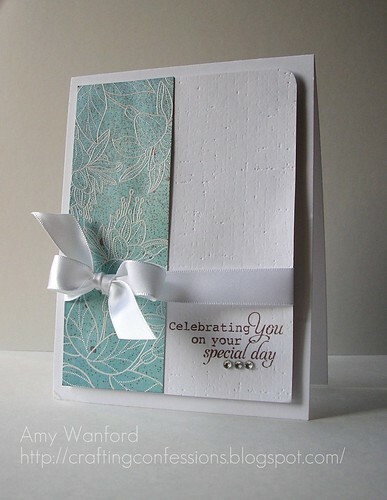 and I decided to carry on the scene onto my card base by clear embossing those twines/vines. Who's my new friend you ask? Well my new companion (aka Pigster) was part of a sweet birthday card from my friend who complained along with a few other friends that I'm the hardest gal to buy a card for. So faced with such a tough task, she went down the distract-her-with-a-free-toy route. Don't worry, I wasn't actually letting Pigster take full control of the car or driving whilst taking pics on my phone! Now what was that saying I was going on about on my birthday about acting my shoe size....? Ha! Have a super duper weekend and I'll hope to catch up with you soon! Happy Tuesday! Happy Mid-Summer's Day! Happy Summer Solstice! Happy Wimbledon! Entering my last year of my twenties....should I celebrate with mature, style and decorum? Or face the fact that I'll always be trying to cram the correct number of candles on my cake, like a kid, no matter what age I am? I do have size 4 feet but this card was for an actual 4 year old - my niece Ruby. She celebrated her special day a few weeks ago. ...I hope I can be more discreet with my own card and presents today...ha! Right then, it's the longest day of the year (well in the Northern Hemisphere, anyways!) so I'm off to make the most of it! Thanks so much for stopping by on my special day! I thought I had until Sunday to make my usual cards for our dads this year. However, my guy had suddenly decided late on Wednesday night that he needed a card to post the NEXT DAY! So it's late, I'm tired, my mojo has gone to bed - what's a gal to do? Sorry for the poor pic - this was taken very late at night by one inky gal who needed to be up early for work the next day! 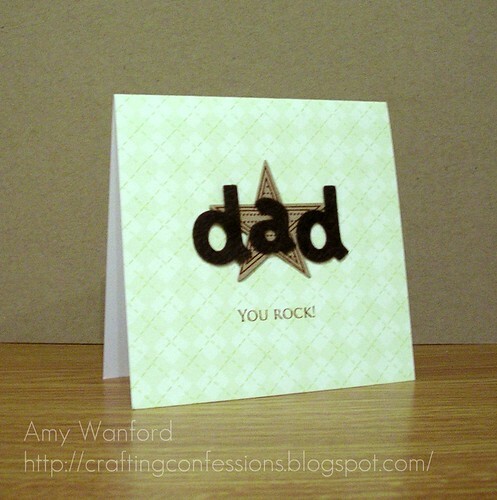 So if you've left it to the last minute to make a Fathers' Day card, there's still hope! Before I dash, I got some happy, inky news that this card was selected for What's Hot over on the Embellish Text Challenge. 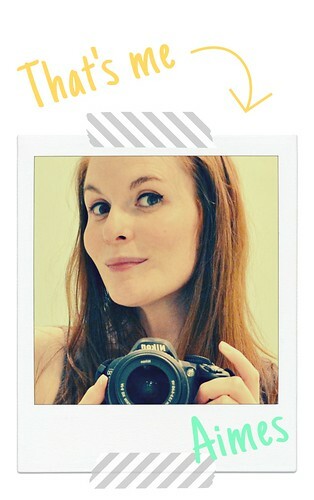 Thanks so much to the super talented designers over at Embellish for picking my card! Finally! Friday Eve is upon us - hooray! It's been one thing after another this week; I'll be so happy when I can grab a few moments to actually stop and think! One li'l thing I have thought about this week is our new CASE study today! You can check out the original post of this creation here! I love the boldness of those colours! Now I'm gonna be straight with ya and 'fess up. My mojo has left the building; I'm not sure where it's gone, or when it'll be back but all I've wanted to do this week is sleep and not ink (Someone take my temperature - quick!) As much as I tried, I just couldn't work those bold colours to give any kinda justice to Jill's creation. So with time running out and lots of cardstock later, I realised that maybe I was over-thinking the whole CASE study this week. Putting too much pressure on myself to conform closely to the card in the spotlight. A wise girlie once told me that the whole idea of CASE study was to let your creativity flow from this starting point and see where it takes you, not to just CASE a card. BTW: The flower is stamped using a rock and roll technique inspired by the current PTI Make It Monday challenge. I promise those shades of blue have much more contrast IRL! Still inspired by those bold colours of Jill's, but injecting just tiny amounts of 'em against a clean white background is like having my cake and eating it *grin* I hope you can tell that I've CASED the colours, part of the sentiment and the use of flowers from the original card. Did you spot the use of another eyelet? Please! Someone stop me; I've only got about a million left to use up LOL! That eyelet and the twine around my ribbon have been colour coordinated using my alcohol markers. No need to buy blue twine (and eyelets although I'm pretty sure I've got some somehwere...) when you can colour white twine any colour you wish! Now I'd advise ya to feast your eyes on the amazing creations whipped up by the rest of the CASE study DT whose mojos are buzzing! So get a good dose of inspiration and get inky with us! I'd love to see what features inspire you from Jill's card and see the creative journey you go on! Reporting from a super sunny, super hot, Sheffield today! Not very often I can say that but today it's true! In fact, what am I doing indoors? I should be making the most of this LOL! Truth be told, I'm not entirely 100% sure about this one...I kinda want to make it again but I doubt I'll find the time right now! 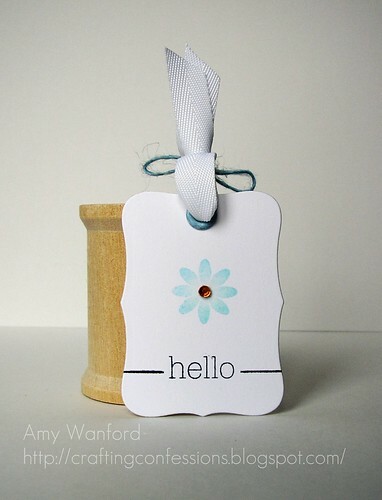 This card was created for our fabulous new challenge over on our PTI blog. All you have to do is pick an element (Earth, Air, Wind or Fire) and go on a creative journey with it: it's ELEMENTary! :) I hope you can tell what element I picked. Clue: colour scheme and sparkling candles! So c'mon and join in the fun and show me how it's really done! I'm sharing a card today that you can find a much better picture of in Card Creations 9! If you haven't got a copy of this issue it's a must have - so much inspiration on every page! I was so happy when this special issue arrived on my doorstep to find that I'm sharing a page with Carly Robertson! I love her style and she's a super sweet person too. It's such an honour to see my card next to hers and on the pages of an issue that's oozes fabulous cards by some of my favourite designers! Before I go, it's my final day as a featured artist over on Inspired by... Thanks so much to Jill for inviting me over! I've had so much fun! Be sure to check it out if you can: Jill's cards are fabulous! Right, I've gotta grab some dinner - I'm starving! Happy Friday Eve! Yup, the working week is nearly over and it's been a busy one here! Time for a new CASE study to get your inky mitts into! This month's muse, Jill Foster, has had me trying out techniques that I haven't had fun with for ages. Can you guess what technique I adopted from her beautiful card this week? Tip: When fussy cutting out those gorgeous fuchsias, don't pain yourself trying to cut out those delicate bits at the end of each flower (sorry, I'm no gardener - what are those bits called?!) simply chop 'em off and re-stamp them on your focal point, before sticking your beautifully cut and coloured fuchsias over the top. I'm diggin' this new set of mine, Celebrating You, by The Craft's Meow. I never realised how versatile it was: it's proving to suit so many different styles! Tip: don't have the right coloured cardstock? Simply colour in white cardstock with an alcohol marker to get your desired colour. I don't own any gorgeous grey cardstock (Soft Stone hardly counts - it's closer to white!) so simply coloured my originally white card grey. Yes. I've finally found a use for two out of the thousands of eyelets I have stored away. Don't tell me you didn't fall victim to the whole eyelet craze: when you needed at least 100 eyelets of every colour and every size. I've got enough to last a lifetime! I think I might even start a campaign to get 'em back in the spotlight. I don't follow trends, I start 'em - Ha! ...I'm so fortunate to be this week's featured artist on 'Inspired by...' Starting today until Friday, Jill Foster will share one of my creations on her blog and produce her own creation inspired by mine - pretty cool huh?! Go check it out, if not to see some of my stuff over there, to see her fabulous creations. Past featured artists include some of my stampy idols: Dawn McVey, Jennifer McGuire and Kristina Werner to mention a few. How on earth did I end up in such fabulous company?! Best act casual and play it cool....who am I kidding? I'm totally psyched about it! HUGE thanks to Jill for inviting me over! Wow! Friday Eve already and I've not squeezed in half as much inky time as I'd hoped. I do have a nice reason for it though: visiting family the past couple of days on a whirlwind tour to eat cake celebrate some birthdays! In fact today's card was created for my SIL's birthday yesterday and is also the card for this week's new CASE study. As you know, a new month means a new muse on CASE study. Although I'm already missing our last muse, Sarah Martina Parker I'm still excited about June's muse. Y'see with this muse, I'm hoping to re-visit lots of stamping techniques that I haven't had fun with for a while....I hope you can join in too as we CASE creations from Jill Foster! 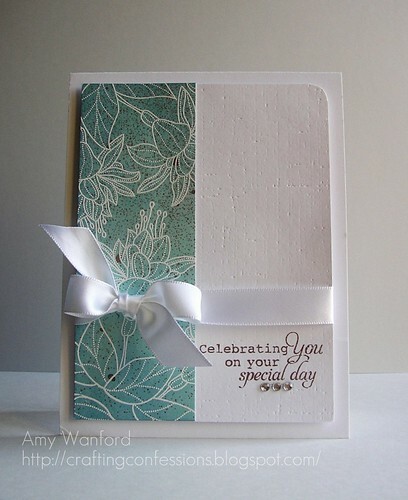 I was inspired by the colours and the way those embossed images totally 'pop' at ya! When I said everywhere, I meant everywhere: my laptop, my jeans, my desk - absolutely splattered with sparkly Glimmer Mist! Hard to believe that panel of aqua cardstock was originally a piece of white shimmer cardstock! 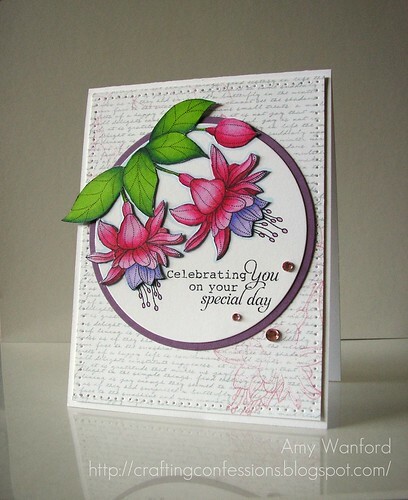 I just got busy with some inks (The inks stay wet longer on the coated shimmer cardstock so blend pretty easily with your average sponge) and busy with the glimmer mist, then embossed those gorgeous fuchsias on top. It shimmers so much more IRL but you'll have to use your imagination to picture it....! Wanna play along? I hope so! Our sponsor this week is The Craft's Meow. I was lucky enough to get a sneaky play with this gorgeous set, Celebrating You, before it was released. You could be lucky enough to win it simply by playing along with us! Gotta say, the stamps are of fab quality: no need to 'prime' them, just peel, stick and stamp away!